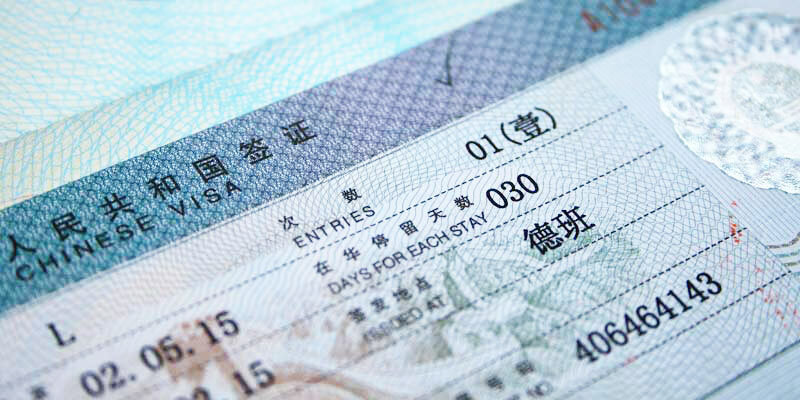 How many days to stay in Xi’an? If I place this visit first, it is simply because it is to be done before the Terracotta Army , for reasons of transport! 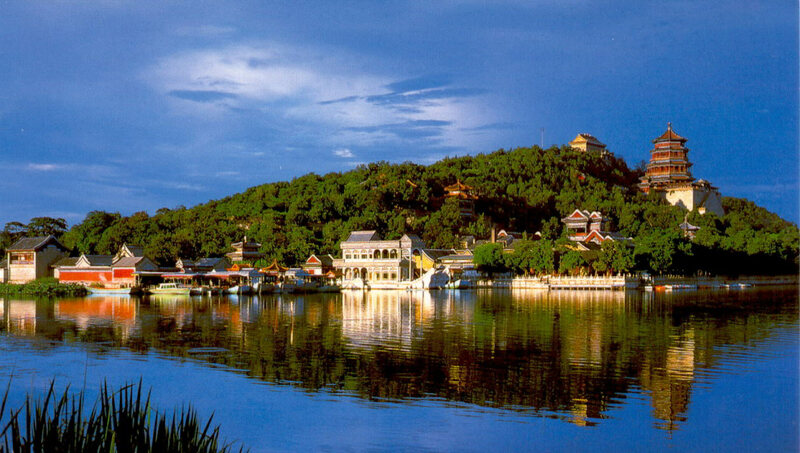 The lower part , where is the palace, the hot springs (Huaqin pool or Hot Springs, 华清池) and the gardens. They were built during the Tang Dynasty, in the year 723. The mountain and its stairs , through which you climb to reach the upper part. There are some sites on the way. The upper part , with the temple and the small villages to visit even higher in the mountain. The best is to start by going up to the temple, simply because if you start at the bottom, you may be too lazy to climb, especially if it’s hot! Once at the top, it is possible to rent horses for 30-40 yuan (about 5 euros) per person, to visit other parts of the site, more distant. It was also on this site that occurred the military incident ” Xi’an Incident ” in 1936, an important moment in the history of modern China. 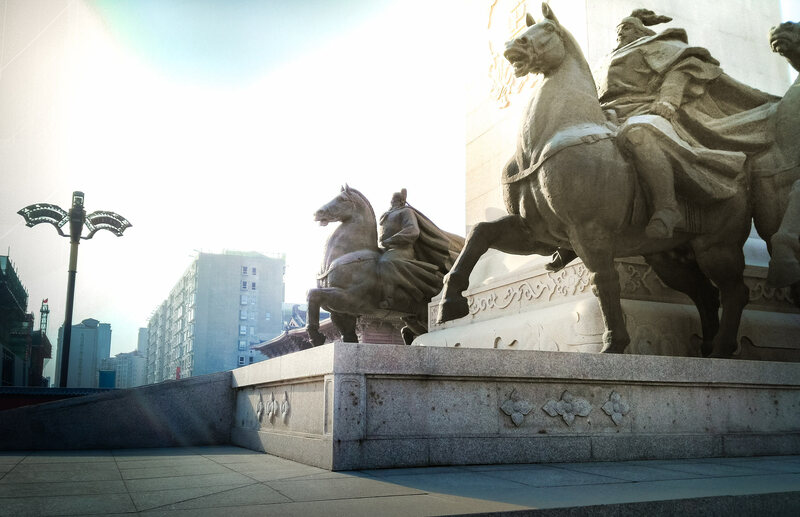 Take bus 306 from Xi’an station and stop at the 1st stop (you can not miss the park entrance with its huge statue). If you want to do the tour, go early in the morning and do the before the army fired. The bus does not stop at the “Huaqing Gong” stop on the way back! 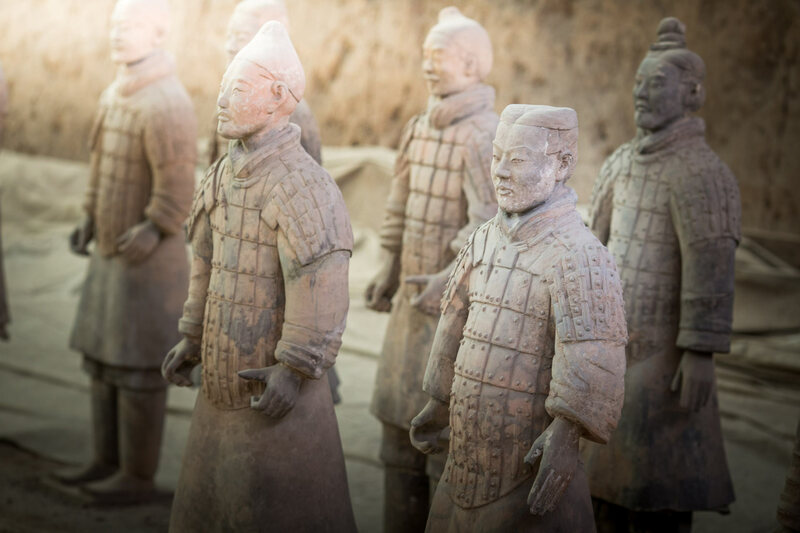 The Terracotta Army , which you will often see as Terra Cotta Warriors , its English name, is why tourists go to Xi’an on their trip to China ! For the visit, you will start by crossing a garden on a few hundred meters, not very interesting. You will then arrive on the main square where are all the buildings housing the warriors. The best is to visit in the opposite direction of the clock (from right to left), to end with the most interesting! The first building houses a museum about the history of the museum (Yes, you read that, they are strong these Chinese!) That will take you ten minutes if you want to read everything. Then, direction “pit” 2 and 3, which are the least good of 3: The pits themselves have little interest, because all the remains are in very bad conditions, but the warriors in excellent condition exposed in the window are worth a look! Near pit 3 is a food court (which I have not tested, having preferred to eat outside the site, at the market) and the site shop, which sells miniature replicas of terracotta warriors. I preferred to take a version “cheap” in resin, since the terracotta probably would not have survived the rest of my trip! To finish, visit the “pit 1”, which is the best known and the one where the soldiers are best preserved. It’s really impressive to imagine the manpower and level of qualification it took to build all of this! If you want to buy little terracotta warriors, I advise you to buy them in the Muslim neighborhood of Xi’anthat I discuss below. They are 2x cheaper than the resin you will find around the site, and they are exactly the same. To get there, take bus 306 to ” Terra Cotta Warriors ” terminus. About 45min 1h of journey. 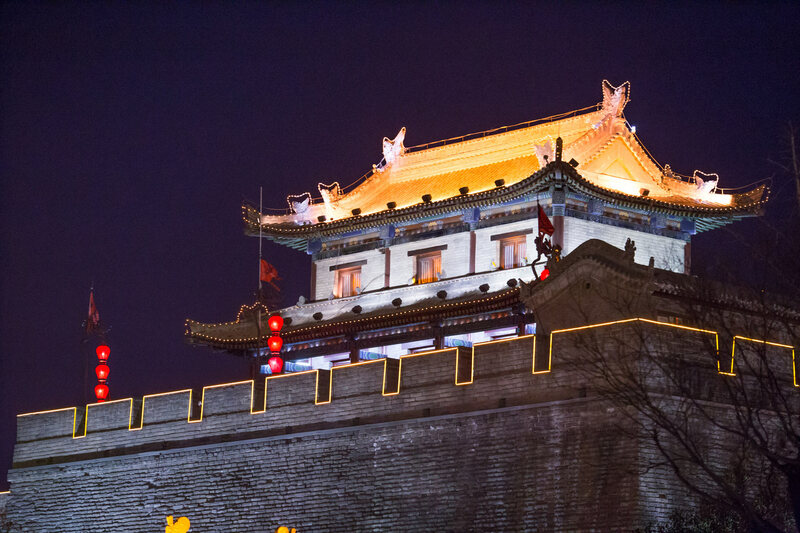 In addition to the Terracotta Army, Xi’an is also famous for these ramparts that surround the historic heart of the city. With a total length of 13.7km, the ramparts that we see today were built during the Ming Dynasty (1368-1644) and are 12 meters high and 12 to 14 meters wide. If you only want to see the ramparts from the outside (without going up), the best time to do it is at night , because they are very nicely illuminated! For those who wish, it is possible to walk on the ramparts and make a complete tour. In this case, you can climb from several places, including the 4 main doors: South, North, East and West. The South Gate of Xi’an City Wall is the most impressive of the 4! To go around, it is of course possible to do it on foot , but also to rent bicycles , or to use the cart service to move between the different points of interest. The best time to enjoy the ramparts is at the end of the day, which will allow you, if you are lucky, to watch the sunset, have one of the night shows and enjoy the lights of the city! 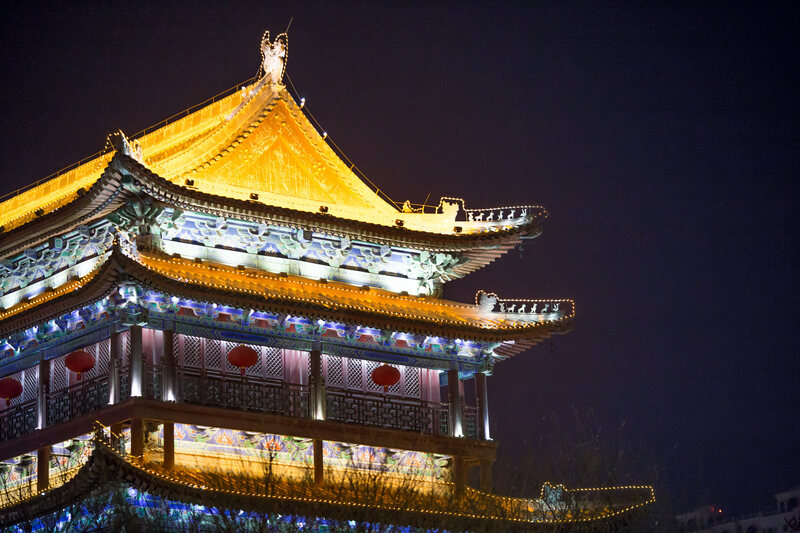 Built in 1384 by Emperor Zhu YuanZhang, the Bell Tower (Xi’an Bell Tower ) once marked the geographical center of the ancient city of Xi’an . It is about 10 minutes walk from the South Gate. From the outside, enjoy all its splendor by going to see her by night: this is the moment when she is the most photogenic! The Drum Tower , originally built during the Ming Dynasty, is located west of the Bell Tower. Just like this, the interior is visitable and the best time to admire its architecture is at dusk. If you want to visit the interior of the 2, it is possible to buy a ticket attached Bell Tower and Drum Towerfor 50 yuan. 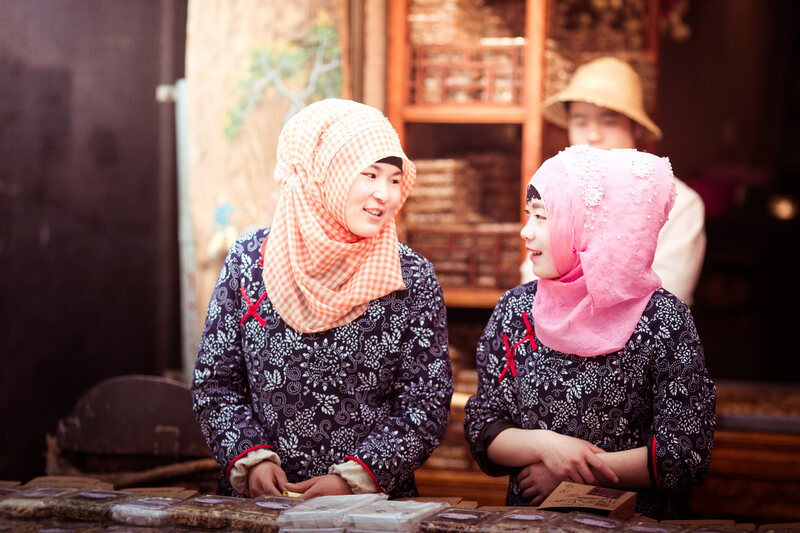 The Muslim neighborhood of Xi’an , which has about 20,000 Muslim residents, is particularly known for its food market . You can enjoy local muslim specialties such as Yangrou Paomo (羊肉 泡 饃) , a delicious mutton stew. The Chinese are known to eat at any time, and at the sight of the amount of good food offered here, you will find yourself obliged to do the same! 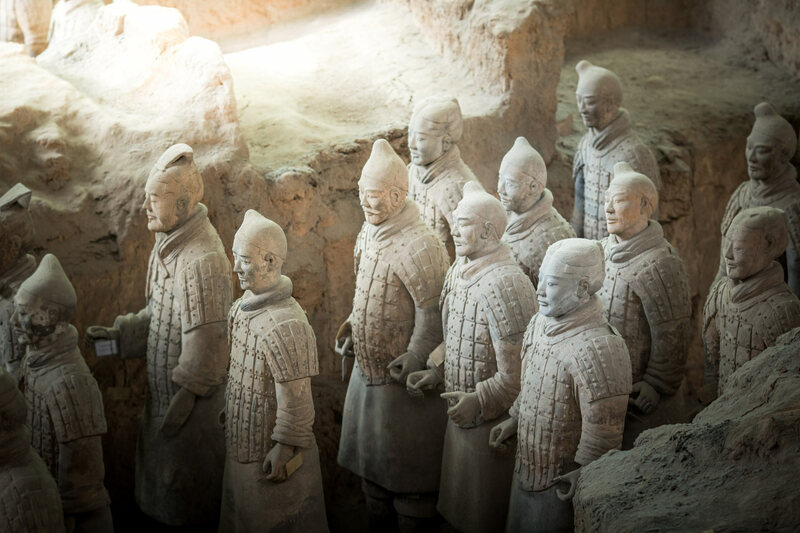 In addition to food, you can also buy souvenirs and artifacts typical of Shaanxi Province , like replicas of terracotta warriors, at a great price! There is also a bazaar a bit “hidden” if you do not pay attention: When you arrive at the market by the side of the Drum Tower , instead of taking the main street that houses all the restaurants and stalls food, continue straight on the small covered street which sinks between the houses. Of dozens of small shops sell bags / clothing / gift / toys etc .. a bargain. And do not hesitate to haggle! The Great Mosque of Xi’an is one of the oldest and largest mosques in China. 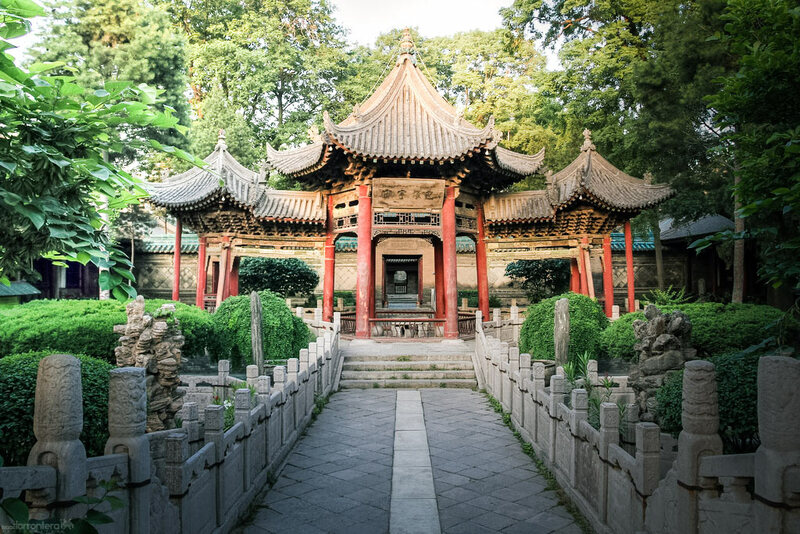 Located in the heart of the Muslim Quarter, it is one of the must-see places in Xi’an, especially for its mix of traditional Chinese and Muslim architecture! The price of the entrance is 30 yuan, less than 5 euros. 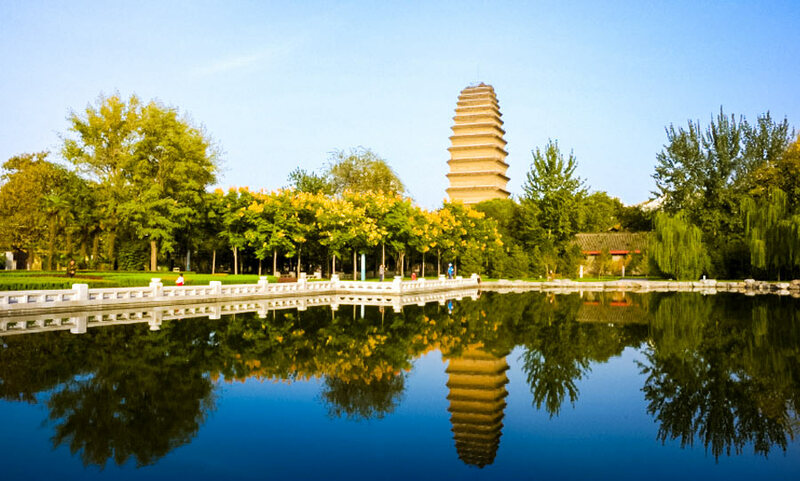 The Great Wild Goose Pagoda is another place of interest in Xi’an City. 64 meters high, it was built in the year 652 and forms with DaCi’en temple a major building of Buddhism. 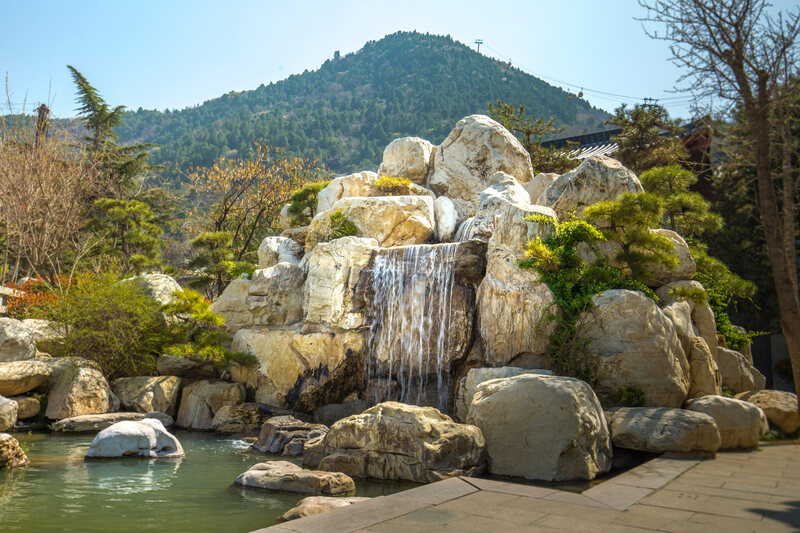 In addition to the pagoda, you can take a stroll around the surrounding gardens and enjoy the shady spots and numerous statues and small pavilions. If you speak Chinese, it’s also an opportunity to meet people and discuss! 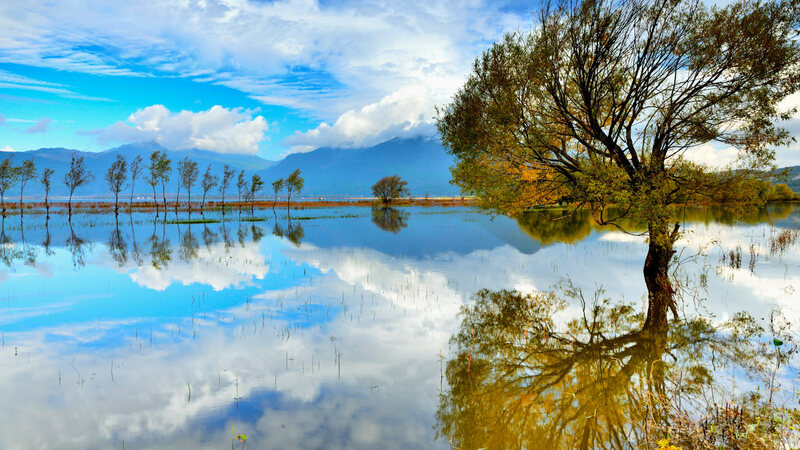 The DaCi’en temple is visitable for 50 yuan. For an additional 30 yuan, it is possible to climb the Great Wild Goose Pagoda and observe the view from one of the arched windows. South of the Great Wild Goose Pagoda is the Great Tang All Day Mall , a street whose center is occupied by 3 theme parks around the Tang Dynasty with large statues, 1.5km. The street is lined by buildings whose architecture is inspired by this same dynasty, including a concert hall. 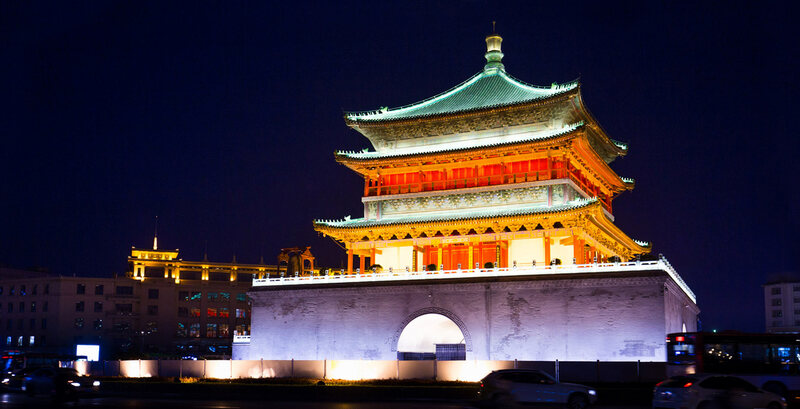 As often in Xi’an, the best time to visit is in the evening, because everything is illuminated. 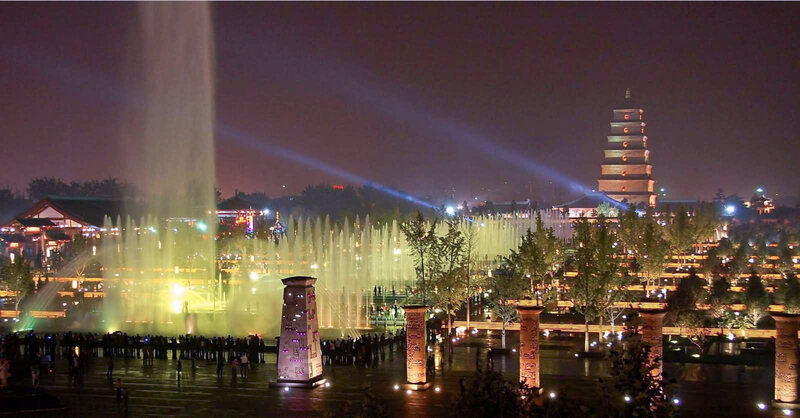 The fountain show in Xi’an (Xi’an Musical Fountain Show) is the largest in Asia. To take full advantage, go at night , this is where the show reveals all its splendor! The last performance is at 20:30 (21h during the summer). Go down, and go between the fountains! Do not hesitate, it’s not forbidden, even if just a few people are there at the beginning of the show, a lot of Chinese people will do it towards the end of the show! This brings a new, rather refreshing perspective. 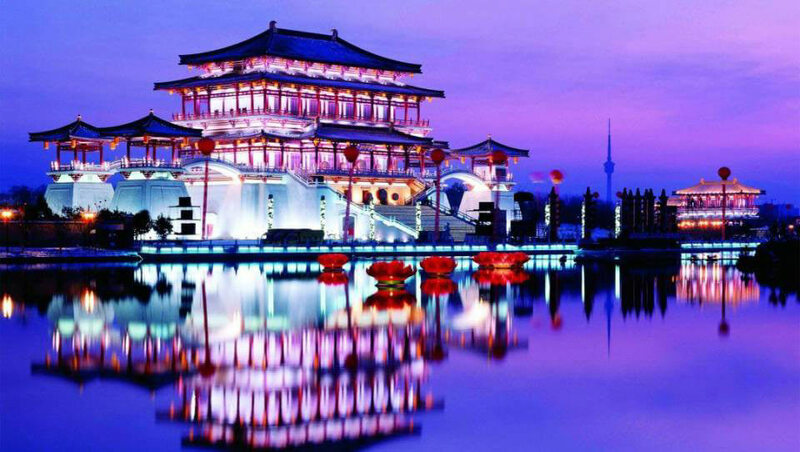 The show of musical fountains Xi’an lasts a total of twenty minutes and is free. Be present twenty minutes before the beginning of the show to have a good place! 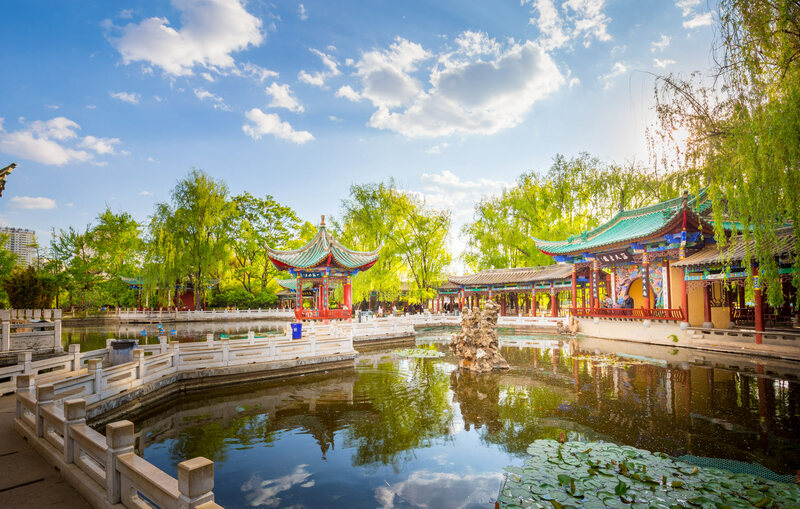 Tang Paradise is a theme park located southeast of the Great Wild Goose Pagoda. It offers reenactments on the theme of the Tang Dynasty. In addition to the many buildings, parks and traditional architectural gardens, shows at fixed times (dance, kungfu, acrobatics, music etc. ..) are planned throughout the day, in the 14 themed areas of the park . A great night show also takes place every night. 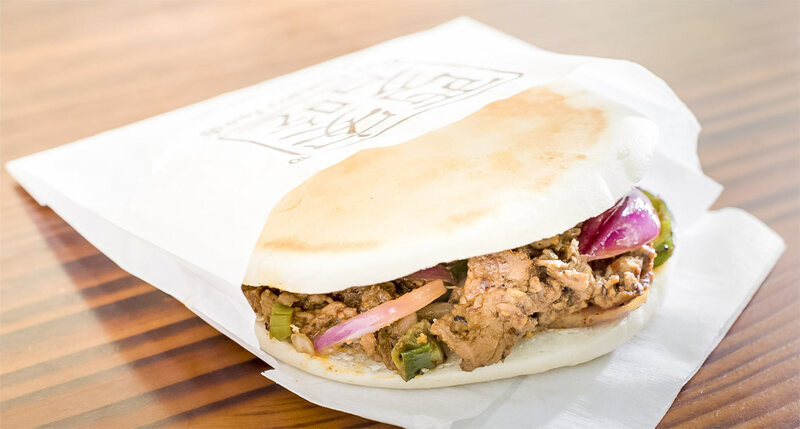 The “Chinese Burger” (Rou Jia Mo – 肉夹馍) is the local culinary specialty of Xi’an and the most famous Shaanxi Province. The brioche, traditionally cooked in a pan, is stuffed with a preparation of meat, most often pork: The Zhi Ro – 腊 汁 肉 whose origins are more than 2000 years! And once you have tasted there, no doubt that it will become the essential dish of your stay. 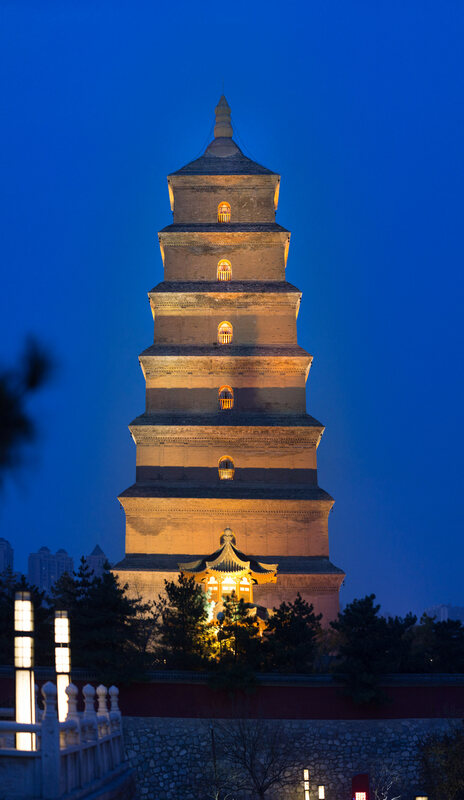 The Small Wild Goose Pagoda (Small Wild Goose Pagoda) is about 45m high and is part of Jianfu Temple. The gardens of the temple are really beautiful and worth a visit, especially since the entrance is free! As for the big pagoda, it is possible to enter and get in there for 30 yuan. As in all major cities of China, there is a lot of museums in Xi’an. Here is a little overview of the main ones! I am not talking about the Terracotta Army because it was treated separately above. Shaanxi History Museum : A museum about the history of the province. In my opinion, this is the priority to see if you are in town! TangBo art museum : Excellent museum on art and Chinese calligraphy. 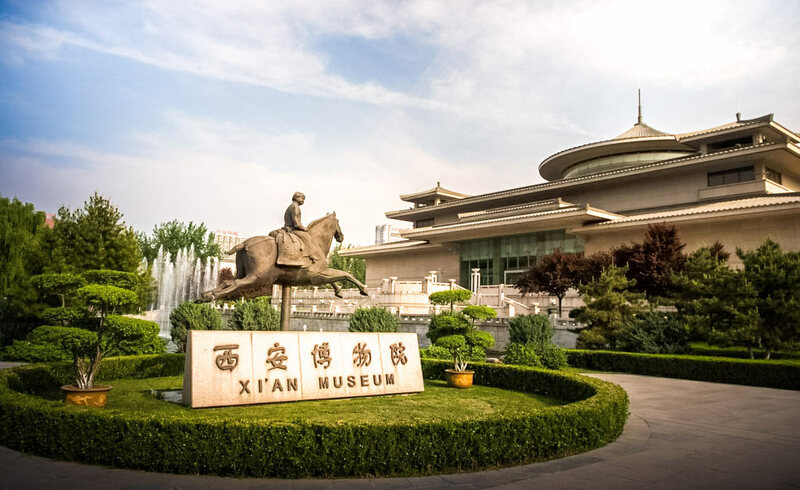 Xi’an Museum : A large museum, complementary to the Terracotta Army, located near the Little Wild Goose Pagoda. Museum of the Forest of the Steles : Located in an old temple of Confucius, this museum gathers more than 3000 steles which for the most part serve as historical documents. Interesting to visit with a guide if you are passionate about Chinese history. Buried Museum Han Yan gling : Located in Xianyang, close to the airport, it presents the figurines in terracotta and carved wood found in the tomb of this emperor (Suggested by Aurélie in the comments, thank you!). 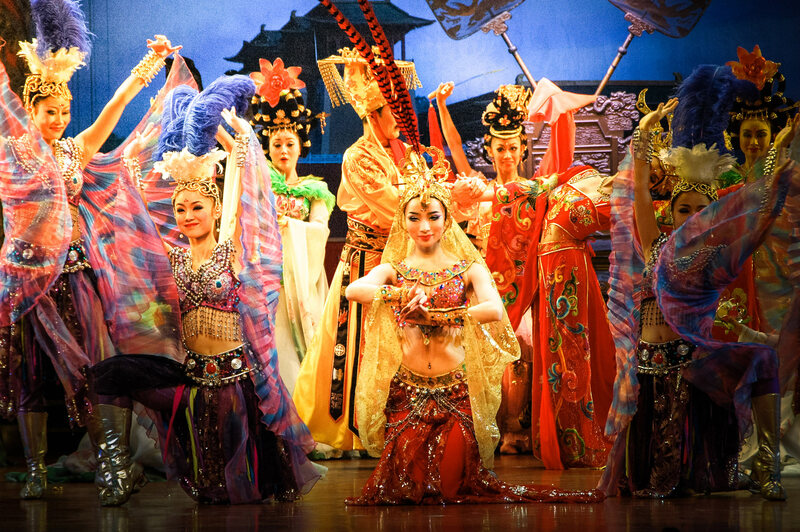 The Tang Dynasty show is a Tang Dynasty- themed cabaret-themed dinner at Tang Dynasty Palace in Xi’an. The 1h15 show is of excellent quality and will allow you to discover the costumes, dances and traditional music of this dynasty! The kitchen is also very good. Several formulas are available, ranging from show only (without meals) for 35 euros to the “Royal Luxurious Banquet” to 180 euros per person. About 1h30 from Xi’an (30 min express train + a few minibus) is Huashan , one of the 5 sacred mountains of China . This hike, rather physical because composed mainly of stairs, will make you discover panoramas among the most impressive of China. By cable car : This is the means chosen by most tourists. You can do the climb, the descent, or both in the cable car. If you do not do both in the cable car, you can mix cable car + gorge trail or downhill cable car + soldiers’ path for the climb. The gorges trail : This is the “normal” way, the most touristy. It is not easy, especially on the 2km before the end, or the stairs are very steep! Once in the North Peak, there are 4 peaks to visit (South, North, East, West), which will take you about 4 hours. This is clearly a must during a trip to China! Well, it will depend on what you chose to visit. Here is a short 5 day trip to Xi’an , depending on what you can visit in a day. Then you choose what interests you the most! For the most eager of you, 2 full days in Xi’an itself (not to mention Huashan) is really a minimum to enjoy what the city has to offer. Day 1 : Huaqing Gong and Terracotta Army. in the evening, photos of the ramparts and Bell tower illuminated. Day 2 : Bell Tower, Drum Tower, Muslim Quarter, Market, Mosque, Great Wild Goose Pagoda, Great Tang All Day Mall, Musical Night Fountain Shows. Day 5 : A little quieter day to rest from Huashan, One or two city museums and Tang Dynasty Show in the evening. What impressed me in Xi’an is the wealth of the city : The avenues are very wide and clean, the luxury shops and gigantic shopping centers are everywhere. The city outside the ramparts is huge and continues to grow at a frantic pace. It is quite far from the image I had made of Xi’an ! As in most cities in China, the locals are really friendly, always ready to help you. And you, what did you plan to visit in Xi’an?